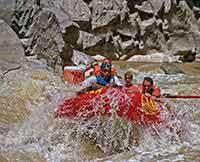 Colorado River Rafters – Western River is the best! The phone assistants at Western River were very friendly and well informed. Our guides were friendly, knowledegable and extremely safety oriented. Safety instructions were given in friendly fun manner, but it was clear that they were important and were to be followed. Our guide was Karen in a paddle boat. She was excellant. Chris seemed to be "in charge" and did a great job of mixing fun with safety and customer service. The help at your counter at the Moab Adventure Center was also customer service oriented. Everyone we encountered made you belive that they liked their work and that it was important for people to feel secure and have a great time.